"From a distance, our solar system looks empty. If you enclosed it within a sphere -- one large enough to contain the orbit of Neptune, the outermost planet -- then the volume occupied by the Sun, all planets, and their moons would take up a little more than one-trillionth the enclosed space. But it's not empty, the space between the planets contains all manner of chunky rocks, pebbles, ice balls, dust, streams of charged particles, and far-flung probes. The space is also permeated by monstrous gravi­tational and magnetic fields. 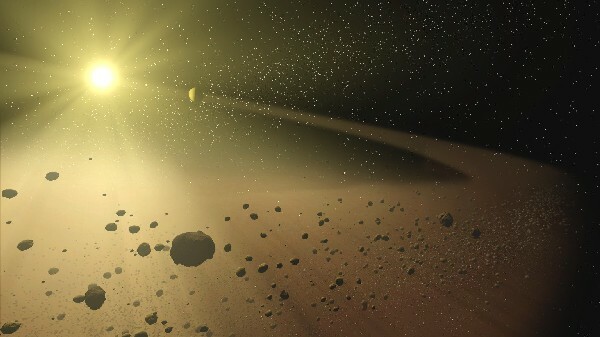 "Interplanetary space is so not-empty that Earth, during its 30 kilometer-per-second orbital journey, plows through hundreds of tons of meteors per day -- most of them no larger than a grain of sand. Nearly all of them burn in Earth's upper atmosphere, slamming into the air with so much energy that the debris vaporizes on contact. Our frail species evolved under this protective blanket. Larger, golf-ball-size meteors heat fast but unevenly, and often shatter into many smaller pieces before they vaporize. Still larger meteors singe their surface but otherwise make it all the way to the ground intact. You'd think that by now, after 4.6 billion trips around the Sun, Earth would have 'vacuumed' up all possible debris in its orbital path. But things were once much worse. For a half-billion years after the formation of the Sun and its planets, so much junk rained down on Earth that heat from the persistent energy of impacts rendered Earth's atmosphere hot and our crust molten. "One substantial hunk of junk led to the formation of the Moon. The unexpected scar­city of iron and other higher-mass elements in the Moon, derived from lunar samples returned by Apollo astronauts, indicates that the Moon most likely burst forth from Earth's iron-poor crust and mantle after a glancing collision with a wayward Mars-sized proto­planet. The orbiting debris from this encoun­ter coalesced to form our lovely, low-density satellite. Apart from this newsworthy event, the period of heavy bombardment that Earth endured during its infancy was not unique among the planets and other large bodies of the solar system. They each sustained similar damage, with the airless, erosionless surfaces of the Moon and Mercury preserving much of the cratered record from this period. that about a thousand tons of Martian rocks rain down on Earth each year. Perhaps the same amount reaches Earth from the Moon. In retrospect, we didn't have to go to the Moon to retrieve Moon rocks. Plenty come to us, although they were not of our choosing and we didn't yet know it during the Apollo program. larger than about a kilometer across will col­lide with enough energy to destabilize Earth's ecosystem and put most of Earth's land species at risk of extinction.